Hell yeah! How good is having an extra day on the weekend? With heaps of long weekends to enjoy this year we’ve put together a list of some of our favourite things to with your extra time. Whether you’re planning to chill with mates, do something as a couple or spend time together as a family we got some ideas for you to check out. Jump in the car and get driving! A long weekend provides no better excuse for a road trip. How far you want to go is up to you. WA is your oyster! Head down south and check out the lovely coastal towns of Dunsborough and Preston Beach or head a little further to experience the wonderful wine region of Margaret River. Before you embark on your journey ensure your road trip will be as safe as possible by visiting our friends at Auto Masters to make sure your car is in tip top condition and receive exclusive Loyalty app dollars on any purchase. Perth’s local island is only a 25-minute ferry ride from Fremantle. Perfect for families, couples or a group of mates, there’s plenty to explore on the island. Rent out a bike and spend a day riding around the island or get cosy on one of the many exquisite beaches. There’s also some of the best snorkelling spots in WA to check out as well as a great pub and restaurants to tuck into. Of course, you can’t forget to grab a snap with one of Rotto’s very own celebrities, the Quokkas. By this we mean camping of course! With such a vast area to enjoy it would be rude not to experience the great outdoors that WA offers. There are many local and further afield camping spots that are perfect for one night or a whole long weekend away. Moore River is only an hour north of Perth and is a great local getaway. Down south there’s loads of spots to become one with the bush; Waroona Dam is great if you like being near a water source, and other spots like Busselton and Bunbury provide a more open, urban camping atmosphere. Sometimes the simplest things can be the most fun! 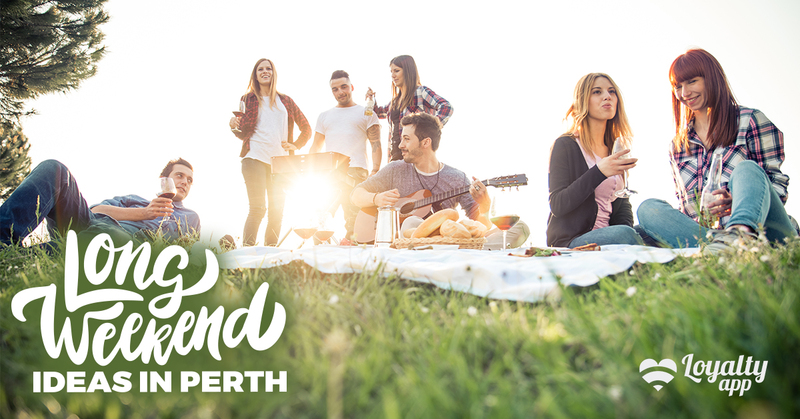 With Perth’s amazing weather (most of the time) why not get out and enjoy the sun. Grab a cheeky coffee from our friends at Coffee Hit and then start soaking up some Vitamin D. The list of ways to enjoy yourself outside is endless. We’re lucky to live on the West Coast with some of the best beaches on our doorstep, numerous local parks and open spaces and a ridiculous array of wonderful locations to explore. Enjoy the weather while it lasts and get stuck into some outdoor activities on your long weekend. Why not get creative on the long weekend? With a bit of extra time on your hands there’s no better chance to add a personal touch to your home. Start a fun project with the kids, mates or let your hair down and show your creative side on your own. If you’re looking to do a bigger home renovation project, our friends at Nicheliving have many years of experience in home improvement solutions. They can help you with any renovation project, big or small. Prefer to party? Long weekends always include exciting events to attend. The Australia Day long weekend and Labour Day long weekends both have such a huge number of things to see, do, and hear, that you’re spoilt for choice. Heading to an event over a long weekend? Make sure you visit one of our delicious eateries to give you the energy to have fun all day and night! Don’t forget you receive exclusive offers at hundreds of merchants if you’re a member of Loyalty app. Download Loyalty app today from the App Store or Google Play and start earning and using your reward points.